Where is the best skiing in the Alps? A question often posed by people from other continents who may have not realised that the Alps stretch out over one thousand miles over five countries: Austria, France, Italy, Germany and Switzerland. There are several thousand ski resorts and each one of them has something different to offer. The resorts, like the countries themselves, have personalities; some are quiet whilst others are bouncing with life. When choosing where to take a ski holiday in the Alps, it really depends on what you are looking for. Is ski-in, ski-out important to you? Do you want great ski but need other activities to keep you occupied? Which European culture do you prefer? Being French accommodation specialists, Madame Vacances sell ski accommodation only in the French Alps due to the extensive area The Alps cover. To cover the entire Alps region would take more than one holiday, so considering the above, we decided to give you a snapshot of some of what we consider to be amongst the best destinations in the French Alps. Each one of them has something that little bit special, but it is by no means a comprehensive list. The French Alps offer the largest skiable terrain in the entire world, so there is more than enough to keep everyone busy. The resorts vary from hip and happening to quiet and cosy, making the French Alps perfect for families, couples and groups. Many of the pistes enjoy a higher than average altitude, meaning snow is pretty much guaranteed every winter season in many of the resorts. Stand-out resorts are plentiful, whether you're looking for family-friendly, activity packed, a real ski challenge or fantastic apres entertainment. 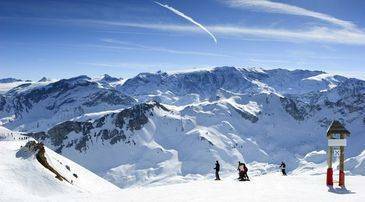 The Grand Massif enjoys the best snow record in France, and with 265km of pistes spread over 1300m - 2600m, there is more than enough skiing to go around. As one of the largest ski areas in France, this area attracts skiers of all abilities. The 117km of easy pistes make this domain a very popular resort for beginners. Unlike many other ski resorts, the Grand Massif has plenty of blue runs interlinking the resorts, so beginners really get a chance to explore. Intermediates will enjoy the red and blue runs that wind through pretty scenery and into attractive villages. Those arriving looking for a challenge will also not be disappointed. There is a particularly steep area near Samoens, but due to some dangerous drops, it is advisable to take a guide. There are five resorts in Grand Massif, situated between 1300m and 2600m. Whilst the area has one of the best snow records in France, there are also 236 snow cannons should the white stuff forget to fall! Perhaps the most well-known resort in Grand Massif is Flaine, a 1960s purpose built resort. However, surrounding Flaine there are plenty of charming alpine villages that add a more traditional feel to the area. Samoens is the most historical and picturesque village, surrounded by dramatic cliffs and a medieval old town, which is dotted with plenty of pavement cafes and bars. Les Carroz is also an authentic French village which is located on the way to Flaine. In the Grand Massif you will find that nightlife is fairly low key, with a large precedent on family-orientated entertainment. Other activities in the area include tobogganing, ice skating and a cinema. Les Deux Alpes is a very reliable resort for snowfall, not only because the snow holds well on the north-facing slopes, but also due to the glacier, which is suitable for those with intermediate ski ability. 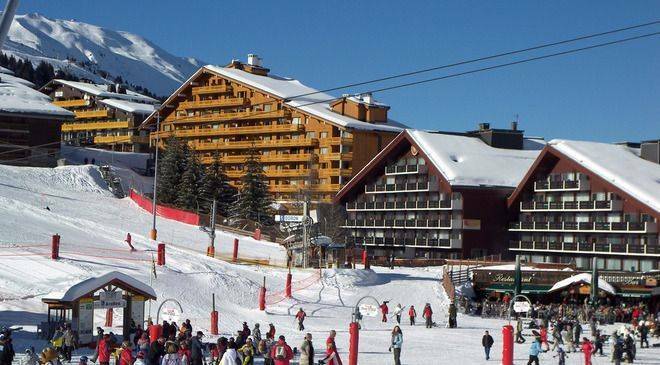 Les Deux Alpes offers 225km of pistes, over an altitude of 1650m - 3600m, and offers high-altitude glacier skiing. The pistes in Les Deux Alpes are roughly spread into 36% easy runs, 44% intermediate, 20% black runs. Beginners can get plenty of action on the snow around the village, and there are plenty of free lifts available to use. Les Cretes, just above the nursery area is also home to some gentle slopes. Intermediates should try some fast cruising between the glacier and Toura. Whilst there are some challenging black runs, the main attraction for advanced skiers is the chance for great off piste skiing. The most popular runs include Grand Couloir Chutes, Clot de Chalance, La Dome Glacier and La Grave. If you want to take a break from skiing, there are plenty of other activities to enjoy in the area, such as paragliding, ten pin bowling and ice skating. Keeping up appearances is not difficult as there are plenty of beauticians and therapists on hand. The resort of Les Deux Alpes attracts the party crowd. It is a very lively destination, with over 30 bars and more than 40 restaurants, so even in the busier periods, it is not difficult to find where the party is at! Many of the clubs open till 4am, and the Avalanche Club is an institution, with the crowd enjoying a mixture of dance and house music. With 425km of pistes: 140 easy, 65 intermediate and 37 difficult, it is easy to see why the Paradiski area is a good choice for skiers of all abilities. The area is extensive, so skiers can enjoy variety between pretty tree-lined runs and high altitude glaciers. Due to the express gondolas in resort, skiers can access all levels of this large domain very easily, the altitude of which ranges between 1200m and 3250m. Beginners can enjoy the nursery slopes around the Vallandry area, which is situated at the lowest level. Paradiski is particularly popular for snowboarders who come to take advantage of a cutting edge snow park which is unrivalled anywhere else in France. Advanced skiers can really take on a challenge by skiing the biggest vertical (2000m) in Europe. This large and varied ski area attracts both families and a lively ski crowd. Each of the villages offers something different, with Les Arcs having the best facilities for children. And if you are looking to keep busy both on and off the hill, this area will not disappoint. Try ice skating, snowshoeing, snowmobiling and tobogganing. There is a great apres ski vibe in Paradiski, particularly in Les Arcs and La Plagne. Bar Mont Blanc is a great option for your first stop after a day on the slopes. Situated in Vallandry, at the bottom of Le Grizzly chairlift, the bar serves easy going food until 10pm and there is usually live music or a DJ setting the mood. If your tastes are a little more upmarket, La Vache is for you. It is also situated in Vallandry but in a hidden corner of the resort. It offers a relaxed atmosphere, top notch food and a brilliant view. For beginners there is a unique attraction to the area of Les Sybelles. Whilst in most resorts, beginners are limited to the slopes at the lower altitudes, in Les Sybelles there is a much wider area to explore at all different levels. This means that the pistes do not get as crowded and the beginner can try a variety of slopes without being too nervous of getting out of their depth! However, as the fourth largest ski area in France, the area does not only attract beginners. There are 310km of pistes located between 1110m and 2620m, with a total of 108 runs, divided into 21 green, 44 blue, 37 red and 5 black. As the majority of the resort is situated over 1600m, Les Sybelles rarely suffers from a shortage of snow. There are also 514 snow cannons within the resort to ensure that snow still covers the runs around the base stations. Les Sybelles is a cost effective destination with plenty of good-standard budget-friendly accommodation. It is also rather low key when it comes to nightlife and so it tends to attract families. Children will love the slopeside laser tag games, treasure hunts and snow sculpting competitions. The Les Sybelles villages differ greatly, with the purpose built resorts of La Toussuire and Le Corbier contrasting with the pretty St Sorlin d'Arves and St Jean d'Arves villages. Restaurants in the area range from low key, self-service style cafeterias to high-quality establishments. If you're after some good partying, there is one club, called Les Carliens which is quite unique in being mountainside, and open air! 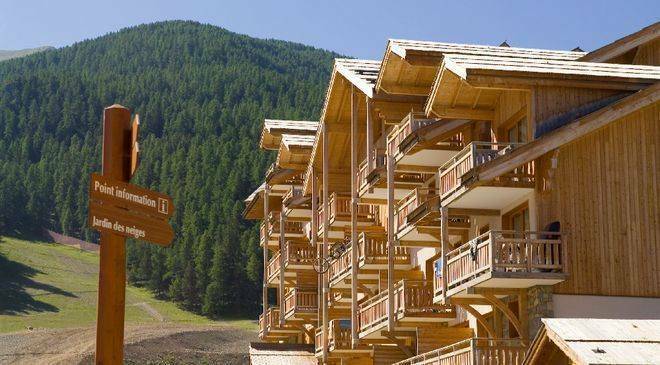 Facing the slopes to the south, 100 metres from the pistes and within easy distance of the village centre Comfortable spacious chalets, south-facing balcony or terrace with views over the Mercantour regional park. 400m from the centre of the resort, shops, bars and restaurants, accessed via an elevator which links the chalet quarter to the resort centre. 100m from the Moretta Blanche red piste and 300m from the Folyères blue piste. Traditional, cosy ski chalets with a fire place in the heart of the charming chalet quarter in La Tania. 200m from the slopes, in the centre of the village, close to the tourist office, shops and restaurants Semi detached chalets with access to indoor heated swimming pool and sauna. Free wifi is available at reception. Close to all resort facilties and an ideal ski-in ski-out location allowing you to access the pistes directly from your apartment. Free access to the Spa "Les Bains du Montana", private sauna in each apartment, beds made upon arrival and end of stay clean included in the price. Located high in the resort with direct trade access. The area of Alp d'Huez is also accessible by cable car. Wellness centre with sauna and hammam. Television available by reservation.